The RAM name has long been associated with Dodge trucks. It began to be used as a model name in 1981 in upgraded versions of the Dodge D Series which had been sold since 1972. Today’s RAM trucks share little with their predecessors. Take the 3.6L V6 Pentastar engine that produced 305 horsepower, more than most V8s in previous RAM trucks ever developed. And if you happen to own a 2013 – 2015 RAM powered by this sophisticated engine, you can improve its performance with the installation of either a Spectre SPE-9016K or SPE-9016B air intake kit. The Pentastar is actually the third in a series of V6 engines fitted to RAM trucks. First was the Magnum 3.9L pushrod V6, which was based on the old Chrysler LA 318 V8 design that dated back to the early 1960s. The 3.7L PowerTech V6 that replaced it was a more sophisticated engine with SOHC aluminum cylinder heads, SFI fuel injection, roller rockers, HD connecting rods, and a 90 degree architecture. The Fourth Generation RAM truck was unveiled at the 2008 Detroit Show. Features added for the 2009 model included a new four-door cab, a five-link coil spring rear suspension on the 1500, and the Rambox, which provides for secure storage inside the truck’s bed walls, and the PowerTech as the base engine. In 2013, the PowerTech V6 was replaced by the Pentastar V6, an engine that then-owner Daimler-Benz had a significant hand in its development. The Pentastar V6 was tweaked for the RAM truck application. The V6 utilizes a lightweight high-pressure die cast aluminum block. This block features cross-bolted mains, aluminum cylinder heads with cast-in exhaust manifolds, variable cam timing with dual independent cam phasing, roller rocker arms, delivers 42% more horsepower than the 3.7L V6 it replaced. THis allows it to achieve best-in-class V6 towing of 6,500 lbs. The torque peak also comes earlier in the RAM version of the Pentastar. Even though the 3.6L Pentastar had been selected twice as a Ward’s 10 Best Engines, it earned a third award for the first year the Pentastar was adapted to, and installed in, the new Ram 1500 pickup. Even though the Pentastar V6 produces 305 horsepower in the RAM 1500, there’s always room for improvement, which is where the Spectre SPE-9016K and SPE-9016B cold air intake kits come in. Everything about the Pentastar was designed so that the engine could breathe. From the low-restriction intake manifold to the sophisticated valve timing, it’s all about fresh air in and exhaust out. Ferrari even developed a twin-turbocharged 3.0L version of the Pentastar for use in the Maserati Ghibli and other models, so there’s plenty of performance potential. What’s great about the Spectre SPE-9016K and SPE-9016B intake kits for Pentastar-powered RAMs is that it brings performance increases that can be achieved by a simple DIY installation that takes less than 90 minutes with basic hand tools with no re-calibration of the engine electronics required. 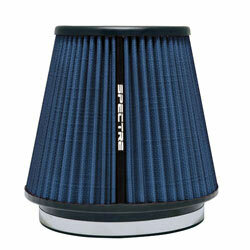 And with Spectre cold air intake kits, you get your choice of filter color. SPE-9016K has a black filter, while the SPE-9016B comes with a blue filter. The Spectre SPE-9016K and SPE-9016B systems move the air intake away from the hot engine and protect it with a heat shield so only fresh, outside air can reach the air filter. Cooler air is denser, carrying additional oxygen prompting your ECU to add more fuel, increasing horsepower. You may have noticed something similar when driving your truck on a cool morning. Key to the system is the Spectre HPR air filter, which utilizes a non-woven, washable synthetic media to help protect your engine from drawing in harmful dirt, dust, and debris. Further the synthetic media is less restrictive than traditional paper elements, and assures excellent filtration. The reusable pre-oiled Spectre HPR9892K (black) and HPR9892B (blue) seven-inch conical filters are manufactured using high quality materials including the synthetic media, durable urethane, and powdercoated steel mesh. Completing the kits are the mandrel-bent polished aluminum intake coupler and a black powder coated heat shield to isolate the intake inlet from high under-hood temperatures. 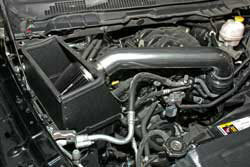 Spectre air intake systems come complete with all necessary clamps, screws, and bolts for the look of an OE installation. OEM brackets and hardware are used so that no holes need to be drilled, making for a quick and easy installation. The kit also accommodates all factory emissions and vacuum lines. The Spectre HPR air filter element is washable and reusable. To maintain its performance, clean your Spectre filter after every 30,000 to 50,000 miles of normal driving, or more often for off-road and heavy dust conditions. The Spectre HPR4820 AccuCharge precision air filter cleaning and oiling system was formulated specifically for Spectre HPR air filters. It is a precision oiling system featuring graduation on the bottle for precise measuring and an easy-to-use squirt top bottle making the application a breeze. The system comes complete with a pump spray bottle of filter cleaner and one of filter oil.